It discourages people from borrowing, using credit cards and applying for loans. It leaves less disposable income in the hands of people who already have loans as most of it goes in paying the interest. Savings increase, which results in a decline in demand for goods. This decline in demand for goods directly affects employment opportunities for the common man. It reduces consumer confidence in investing and entrepreneurial pursuits. Thus, real estate prices come down as lesser number of people apply for home loans. Established business owners hold on the expansion, fearing the higher cost of borrowing, thus, affecting economic growth of the country. A lower interest rate, on the other hand, sparks investments and credit opportunities and aides in growing economy. High interest rates leads to a fall in Aggregate Demand (AD) in the economy, contributing to a number of socio-economic issues and creating a vicious circle. Bank Rate: A bank rate is the rate at which the RBI (Reserve Bank of India) lends money to commercial banks. This lending is for a longer duration, ranging from 90 days to one year, and involves no collateral. Banks profit by charging customers higher interest than the RBI. Thus, when the RBI lends at a higher interest, the interest rates rise. Repo Rate: Also known as the repurchase rate, it is the rate at which commercial banks borrow money from the RBI to close the gap between the demand for finances (loans) from customers and how much they have left to lend (supply). It is a short term loan (two days to three months) provided to the banks against securities (usually bonds), with a promise from the banks to repurchase the securities within a short span of time. Repo rate helps the RBI in maintaining the liquidity in the market. When the RBI wants to make it more expensive for banks to borrow funds, it increases the repo rate, thus, increasing the cost of borrowing (interest) for the common man. Thus, both are fixed by the RBI, both affect rates of interest and both are means to control cash flow in the market. 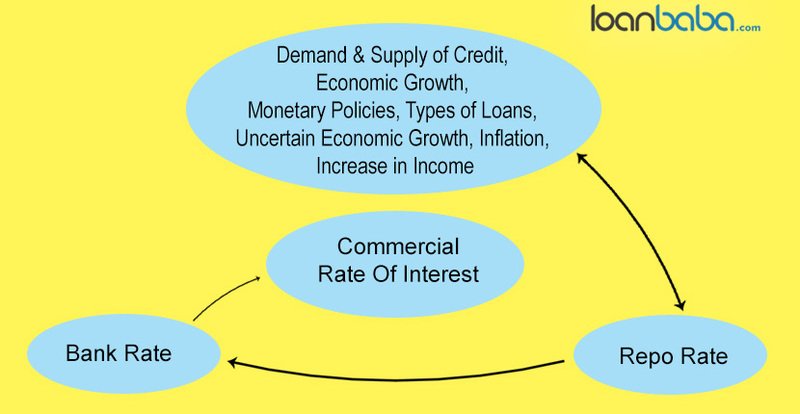 Demand and supply: An increase in the demand for loans and credit will increase the rate of interest, while a higher supply of credit will cause a fall in the rate of interest. There is a rise in the supply of credit when people open bank accounts, making money available to lend. However, when people defer payments towards their loan, it decreases the amount of credit available, thus, increasing the rate of interest. Inflation: Rates of interest are significantly affected by inflation and deflation. Inflation causes interest rates to rise because of the decrease in the purchasing power of money. Also, under inflation, people with investments demand a higher rate of interest for the same reason. This pushes the interest rates further up. Type of loan: Lending money always involves the risk of it not being paid back. For the types of loans that are â€˜unsecuredâ€™ the rate of interest is usually higher. Increase in income: With rise in general wage rates, the rates of interest also rise. Monetary policies: If the RBI relaxes the policies to increase liquidity in the market, it causes a fall in interest rates. However, this can cause inflation. But, with stricter policies the rate of interest increase bringing the inflation down. Thus, RBI has to balance the monetary system. This is where the RBI needs to set the repo rate. And, this repo rate affects other interest rates. Economic growth: With a thriving economy, the demand for credit increase, as do the interest rates. Uncertain economic future: Under volatile conditions, such as elections, new government, changing government policies, etc., lenders secure themselves against the uncertain future by increasing interest rates. Apart from these factors such as unemployment, commodity prices, spare capacity, exchange rate, real estate prices etc. also have a significant impact on interest rates as they are all linked together. Previous story Layman Series: Who is a Guarantor and What are Guarantor Loans?